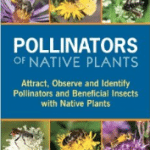 The Pollinator Conservation Handbook, by The Xerces Society and The Bee Works, is a wonderful resource for all Ecosystem Gardeners to support native pollinators. Most of you have probably heard of Colony Collapse Disorder, a phenomenon where honey bees are dying off by the millions. A large part of our agricultural food supply is dependent on pollination by honey bees, this collapse is a matter of great concern to farmers across the country. Because the rise of factory monoculture farms has co-evolved with industrial bee keeping here in the U.S., our food supply has become dependent on the services of the non-native honey bee, to the exclusion and detriment of our native pollinators. The collapse of honey bee colonies caused farmers and the corporate agricultural industry to turn their eyes to native pollinators to fulfill the essential ecosystem service of pollination of our food supply. However, it was soon apparent that many native pollinators had vanished and others were in sharp decline. 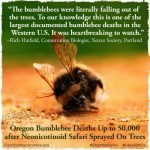 What Happened to the Native Pollinators? Habitat loss and fragmentation–both the outright destruction of habitat, and chopping it down into smaller and smaller isolated fragments threaten the diversity and abundance of native pollinators (and all wildlife). Habitat degradation–this reflects both the influx of invasive species and some land management practices, such as modern mowers and string trimmers which can cut in places which previously would have been left to grow, reducing both floral and structural diversity. Invasive organisms outcompete native species, replacing them with inferior foraging and egg-laying opportunities. Herbicides used instead of hand weeding kill all plants, removing forage for native pollinators. 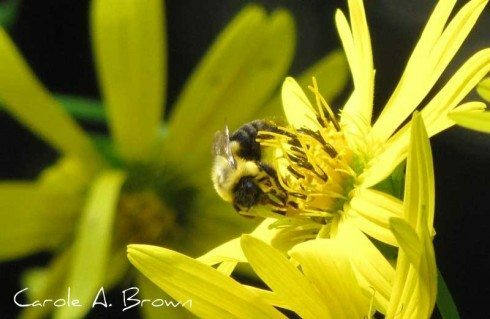 Our passion for “neatness” is destroying habitat for pollinators. Pesticides–don’t just kill target species, but kill all species. Pesticides and herbicides are having a disastrous impact on native pollinators. Pesticides kill directly, while herbicides reduce the variety and amount of available forage. These threats to our native pollinators are all the result of human action, and it will only be through human actions that reverse these trends that pollinators (and all wildlife) will be able to survive these dangers. Plant a wide diversity of plants whose bloom times overlap and last from early spring through late fall. Diversity is key here, you want lots of plants that bloom in March/April, lots in bloom through the summer, and a wide variety of blooms through the fall. 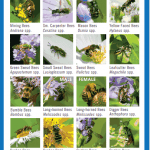 The more diverse your plantings, the more pollinators you can support. Protect and create appropriate nesting and egg-laying sites. 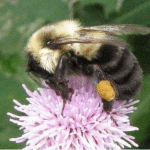 Bees need sites in the ground or woody vegetation and nesting materials and butterflies require appropriate host plants (each species requires a specific plant). Many bees nest in the stems of flowering plants, so don’t cut them down until the following spring after the bees have emerged. Create sheltered, undisturbed sites for hibernation and overwintering. Brush piles, rock piles, log piles, and hedgerows are great ways to accomplish this. Planning your Ecosystem Garden to support native pollinators will also benefit many other species of wildlife. Everything is connected, and actions taken to help one kind of wildlife often have beneficial effects for other species as well. 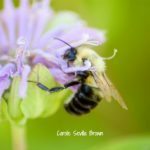 What are you doing for pollinators in your Ecosystem Garden? Do you have a butterfly garden, bee nesting blocks, or safe places for pollinators to spend the winter?